The monotypic Neotropical genus Rigel is known only from the type-species Rigel chiliensis from Las Cruces, Chile. Kuschel (1960) mentioned that Megalyridae exist in South America but Rigel was not described until the late 1980s (Shaw 1987), making it one of the first named Megalyridae species from the neotropics. The genus name is a reference to the star of the same name in the constellation Orion. Orion being the sword-bearing hunter constellation, this is a reference to the long ovipositor of this wasp. The phylogeny of Rigel was examined by Shaw (1990), who placed the genus in the monobasic tribe Rigelini at the base of the megalyrid tree. There are two Chilean genera of Megalyridae (Rigel and Neodinapsis) but they are known only from separate localities, and they may not exist sympatrically. Shaw (1990) suggested that this may be evidence of the "composite area hypothesis" for western South America. As South America drifted westwards following the rifting of Gondwanaland, the Chilean margin may have accreted outlying islands and continental fragments, capturing remnants of ancient megalyrid populations. Both Rigel and Neodinapsis may be viewed as relicts of very archaic megalyrid faunas - Rigel being the most basal of all surviving megalyrid genera. 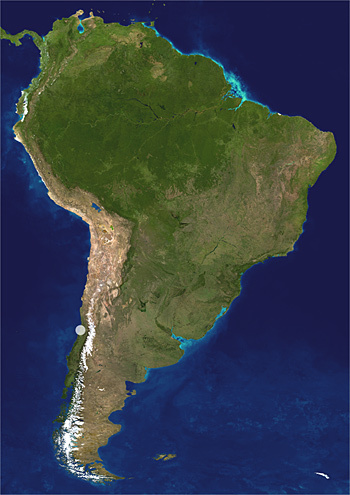 Distribution of Rigel chiliensis (Shaw, 1987); the white dot represents the single known collection locality. Satellite image courtesy of NASA / JPL. Autapomorphies of the genus (and species) include densely setose eyes and clear wings without infumate bands. In appearance Rigel is most similar to the South African genus Megalyridea. Both share a finely shagreened body sculpture but Shaw (1990) regarded this as a symplesiomorphy retained by both basal genera, not an indication of close relationship. Rigel differs from Megalyridea by lacking a distinct carina along the upper margin of the subantennal groove, by lacking a row of foveae along the genal orbit of the compound eye, and by having entirely clear wings. Rigel chiliensis is about 3.5 mm long with an ovipositor about 6 mm long and is mostly black in color. The species is still known only from the original collections in 1958 at the type-locality in Chile. Kuschel, G. 1960. Terrestrial zoology in southern Chile. Proceedings of the Royal Society of London 152: 540-550. Shaw, S.R. 1987. Three new megalyrids from South America. Psyche 94: 189-199. Shaw, S.R. 1990. 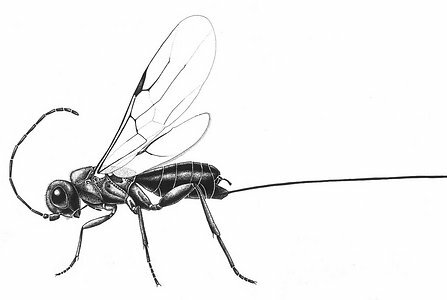 Phylogeny and biogeography of the parasitoid wasp family Megalyridae (Hymenoptera). Journal of Biogeography 17: 569-581. Thanks are extended to Dr. Lynn S. Kimsey for allowing us to post her excellent ink illustration of Rigel chiliensis.